Protesters demand justice in police killing, Feb. 23. Oakland, Calif. — Two police officers in Emeryville, Calif., a town located between Oakland and Berkeley, gunned down and killed Yuvette Henderson, a 38-year-old Black mother of two, in a parking lot on Feb. 3, over an alleged shoplifting incident in the Emeryville Home Depot store. 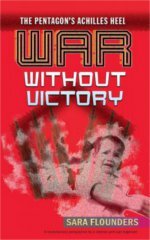 Two weeks earlier and half a block away, when a white man named Sebastian Ledwick fired on police officers, the cops first retreated and then apprehended him without killing him. That police reacted more violently against a Black woman cornered in a parking lot than against a white male firing deadly shots at them is itself proof of racial bias. Such racist injustice has provoked national demonstrations on a broad scale since last August. 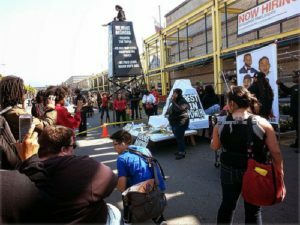 It is no surprise then that on Feb. 21, coinciding with the national commemoration of the assassination of Malcolm X, people shut down the Emeryville Home Depot for five hours. Henderson was cornered by the Emeryville Police Department at the Extra Space Storage Facility garage in Oakland, a few blocks from the Home Depot. She was shot at seven times with the bullets coming from three weapons, including a military-grade, automatic AR-15 rifle, the same weapon used by the U.S. military in wartime. Police originally claimed that officers were “advised” that the suspect was armed with a gun. Issued at the time with authority, this statement has since been edited out of original media reports. Now, the police claim they asked Henderson to drop her weapon and when she refused, they shot and killed her. Police have never stated that Henderson pointed a gun at them. Henderson fired no shots. Michelle Shepard and Warren Williams are the officers responsible for Henderson’s death. Both have been placed on paid leave during the investigation. Williams was wearing a body camera which was turned off during the shooting. Some 200 people attended the Feb. 21 rally at the Emeryville Police Station, organized by the Anti-Police-Terror Project. Henderson’s brother spoke for her at the rally. People from families of other victims of police killings spoke as well. Cadine Williams spoke about her brother, O’Shane Evans, killed by the San Francisco Police Department last Oct. 7. La Mesha Irizarry spoke about her son, Idriss Stelley, killed in 2001 by the SFPD. 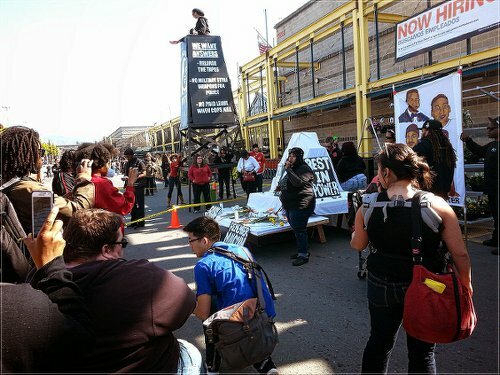 The protesters marched two miles from the police station to the Home Depot store, where they joined the Black Out Collective and Black Lives Matter-Bay Area. These groups, in coordinated action, had locked down the three front doors of the store with their bodies, along with activists from Asians for Black Lives and the Bay Area Solidarity Action Team. The entire front entrance to the store was also blocked off by the protesters with yellow tape lettered, “Crime Scene” in black. They erected a siege tower, at the top of which Cat Brooks of ONYX sat during the entire five-hour siege. Two other families of victims of police killings joined the crowd at the Home Depot and spoke about their loved ones. Cyndi Mitchell spoke about her brother, Mario Romero, who was killed by the Vallejo police, and Dionne Smith spoke about her son, James Rivera Jr., killed by the Stockton police. About 400 people participated in the event during the rally, march and Home Depot shutdown.